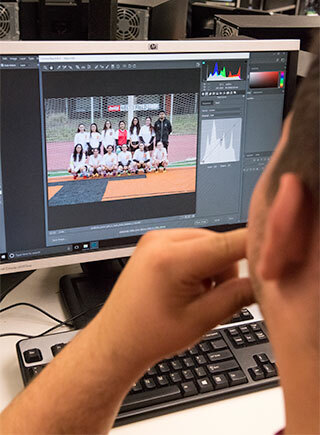 FHS junior Edgard Pyavka works on sports team photos for the yearbook. Photo by Ahmylie Francecisco. The process of making the yearbook was both intense and gratifying. Working on the yearbook was a lot of work. Not only was it stressful but in the end it was worth it. Not only is there a lot to do but you have to do it on a deadline. You have to have pictures, and stories and everything done in a period of time and if you don’t it makes things more stressful. Contributing to the yearbook was not only stressful but it was fun to. I got to learn more about what it’s like behind the scenes. How it works to place pictures and the way you have to write stories in past tense. Everything in the yearbook has its own way to do it. Everything needs its small details and its big ones. Doing something like the yearbook shows you how you can edit pictures and write stories in past tense, and you learn how to do them and most likely you learn new things about people and the subjects in the yearbook. In the yearbook there are different sections. For each section there is someone in charge. I happen to be helping with the Features section, which was led by Alyssa Harcourt, a senior. The process you have to do is get the story and then get pictures. Depending on the pictures, you have to edit them and crop then place them where they would belong. That’s when the small details come into play, like the headlines and the paragraphing in the story and names of people who wrote them. At the end everything seemed to fall into place, and the yearbook will look nice thanks to everyone that worked and put effort and time into it. As the only freshman editor in this class, I was given some responsibility. What I did was find pictures, edit them, and place them. I wrote some of the stories that are in the yearbook. But after a lot of time and staying after school for more than four-plus hours and doing work in class I was able to get everything done. There were about 41 features in the yearbook and I placed most of the pictures. IF I were asked if I wanted to do a yearbook again, I think I would. But I think things would be a little different the next time around. It would have been easier if maybe we started a little earlier and maybe we had all the pictures beforehand instead of getting most of them while doing the layouts. I think that we may have not been so stressed if we did that. But at the end of the day stress in inevitable, and I think the yearbook turned out well.